Updated Aug. 8, 9:40 a.m.
Users have one option: Slap her for speaking. Although several women's rights organizations have condemned the idea, an anti-Hillary super PAC has refused to remove "Slap Hillary" from their website, allowing individuals to virtually hit the former secretary of state with a click. Hillary Clinton for president in 2016? 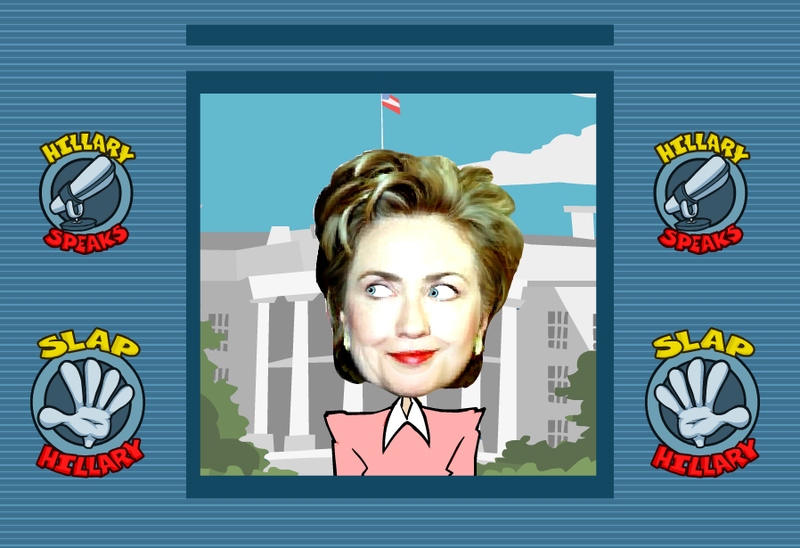 The Hillary Project posted the clickable graphic earlier this week in which an animated Hillary Clinton stands outside the White House, and users can click "speak" or "slap," cueing a graphic hand to whack her across the face. The game had been on the internet since 2000. While it's their violent tact that several people have taken fault with, some also used the interactive tool as an example of GOP disconnect with gender equality. "This ridiculous behavior is why no amount of 're-branding' is going to help Republicans win over women voters -- they just don't get it," EMILY's List Communications Director Jess McIntosh said in a statement. "Violence against women isn't a 'game.' Slapping a woman for speaking isn't actually a joke. It's just gross." Like EMILY's List, another organization for gender equality, Ultra Violet, has called on House Speaker John Boehner, R-Ohio; Senate Minority Leader Mitch McConnell, R-Ky.; and Republican National Committee chairman Reince Priebus to speak out against "Slap Hillary." There's no comment from those leaders, however, The Hillary Project is an independent group, not affiliated with Boehner, McConnell or the RNC. The super PAC touts itself as "nonpartisan." "The Clintons and their followers are going to lecture us on the treatment of women?," The Hillary Project's Fred Wilcox told CBSNews.com. "Did Hillary refuse large donations from movie producers and game builders whose products advocate violence, sexual exploitation and degrade women? Certainly not - when they were ready to cut checks she and her supporters forgot all about the appropriateness of their treatment of women." In 2008, SlapPalin.com posted a game similar to "Slap Hillary" where users can drag a hand across the former Alaska governor and 2008 Republican vice presidential nominee's face to slap her "back to Alaska."